Purchase links: 1 Click - Full Slip - Lenti - 1/4 Slip (Pre-order on Nov 9 at 10 PM Korea Time, UTC+9). I´m on the fence with today´s Nova announcements. I mean, I like they dare to release such a catalog titles but on the other hand there are so many better films to choose from . ^ Speaking of INGLOURIOUS BASTERDS ... Lol ... maybe would've been better with its original title ONCE UPON A TIME IN NAZI OCCUPIED FRANCE cos as we all know QT can't spell to save his life ... but with his encyclopedic knowledge of films it's also possible that he didn't want to copy the exact title of the correctly spelled Italian film from 1978 INGLORIOUS BASTARDS. Also just happens to be QT's most successful film to date at the box-office. 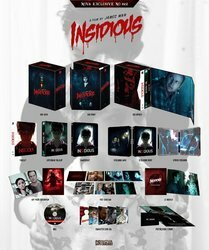 Imaging if they do both Insidious and The Conjuring series. Premium horror release , choice of movie . I think I'm in the minority not liking it though. NE22? Anyone got news on this? This release is coming out of nowhere! Not really, it's been known for a couple of months they were working on it. What's not clear is if they're going to do the rest of the series, as well as Conjuring, Annabelle, etc. or if this is going to be a one off like Taken. IIRC they already said they won't be. Definitely in for this. Hopefully Nova release the other installments as well. Are they only online now?